Masala coconut rice is a spicy, tasty preparation. You can use it as a lunch box recipe to add variety. This recipe also comes in handy, if you have to dish out something at a short notice. Masala coconut rice has the flavor of coconut with an underlying subtle sour taste of tamarind. Just give it a try! Method: Wash and cook rice with 1 tumbler (200ml) of water in a pressure cooker for 5 minutes or 5 whistles. Once the pressure subsides, remove from the cooker and allow it to cool on a plate. Roast red chilli, urad dhal and Bengal gram dhal in a kadai, till the dhals start turning golden brown in color. Switch off the fire. Allow it to cool. Later powder the fried ingredients with asafoetida and keep aside. Soak tamarind in 50ml of warm water for 15-20 minutes. Later squeeze the tamarind and extract the juice. Keep aside. Heat coconut oil in the kadai, add mustard seeds and when they start to sputter add urad dhal. Fry till the dhal turns golden brown. Add tamarind extract and bring it to boil. Allow it to boil till the raw smell disappears. Reduce the fire. Add the masala powder, salt and jaggery. Mix well and cook on a low flame till oil separates. Add coconut gratings and curry leaves. Mix well. Switch off the fire and allow it to cool. Now add the cooked rice. 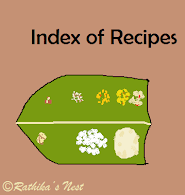 Mix gently the masala with the rice using your hand or a rice spoon (சாதக்கரண்டி). Serve with appalam or vadam.